Miriam Taylor, career scoring leader for the Camdenton Lakers, is continuing her career at Lewis & Clark CC in Godfrey IL. The Trailblazers visited St Louis CC in what could well be a preview of the NJCAA District D playoff in November, with the winner advancing to the National Finals. The Trailblazers came away with a 3-0 victory, slightly below their current 5.4 goals per game average in their 10-0 season so far. Lewis & Clark are ranked #10 in the National NJCAA Poll and sport a 10-0 record following Monday’s win. 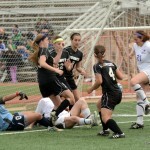 They have defeated five of the six teams in Region 24 by a combined score of 30-3 with three shutouts. That should lead to a top-seed in the Regional playoff in November with the winner advancing to the District D playoff with the Region 16 (Missouri) champions. The Southwest Baptist Lady Bearcats opened their Spring season in late March, as part of the Parkway College Showcase tournament. Facing off against the GLVC Champion Quincy Hawks, the Bearcats came out focused on continuing the strong improvements shown in the second half of 2012. 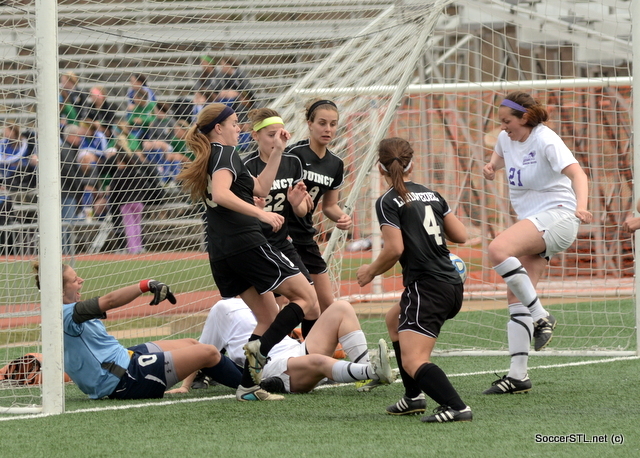 The Bearcats gave up a 1st half goal on a set piece, with the final shot deflecting beyond the reach of starting goalkeeper Paige Hemphill (Ozark/MO Elite), a member of the 2010 Southwest All-Stars. They went on to control the majority of the play in the second half en route to a 1-1 tie. 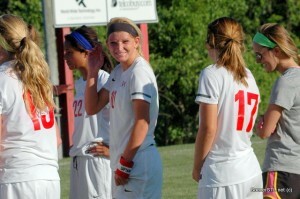 SBU’s goal was scored by Molly Marcotte (Republic/MO Elite). A corner kick seeking Ashley Creason (Lees Summit), the Bearcats playmaker, found her on the far edge of the six yard box. Her header fell to teammate Taylor Schmidt (Liberty) who’s shot was parried by Chapie. Two more shots, by Karla and Kate Jamison respectively were also rejected but as Karla Jamison fell into the box, Marcotte hammered the loose ball into the roof of the net (pictured). The Bearcats have a home game Saturday. At 2pm they host Missouri S&T. They travel to Springfield on April 27th to play at Missouri State and later against Butler CC, times to be determined. One thing I’ve learned in 10 years of Spring games is not to put too much weight on the results. Too many variable as teams are more focused on development and experimenting with players in different positions. Regardless, they’ve got a strong junior class led by Creason with her two Southwest Missouri teammates. With a pair of teammates (Nicole Billmeyer and Brittany Marino) from the #1 St Dominic team coming in this Fall, there’s a good recruiting class as well. The Mizzou soccer team has announced its spring schedule, which features home games against Iowa (March 9) and SLU (April 20) and a contest with the new National Women’s Soccer League’s FC Kansas City squad (March 20). The Tigers will also face Oklahoma State (March 2) and Nebraska (April 13) in Kansas City. Missouri opens spring play on Saturday, March 2 when the squad faces Oklahoma State at Noon at Swope Park in Kansas City, Mo. The Cowgirls are coming off an 11-6-3 season in 2012 but lost senior All-American goalkeeper Adrianna Franch to graduation. On Saturday, March 9, the Tigers welcome Iowa to Walton Stadium for a 10 a.m. contest. In 2012, the Hawkeyes boasted a 12-6-3 overall record and a 3-5-3 mark in Big Ten Conference action. The Tigers face FC Kansas City of the new National Women’s Soccer League on Wednesday, March 20 at Shawnee Mission North High School at a time to be determined. FC Kansas City roster includes players such as U.S. National Team member Lauren Cheney and 2012 SEC Offensive Player of the Year Erika Tymrak. On Saturday, April 13 Mizzou returns to the pitch for a game against former conference foe Nebraska at St. Teresa’s Academy in Kansas City, Mo., at Noon. In 2012, the Huskers went 7-12-1 overall and 4-7 in Big Ten play. 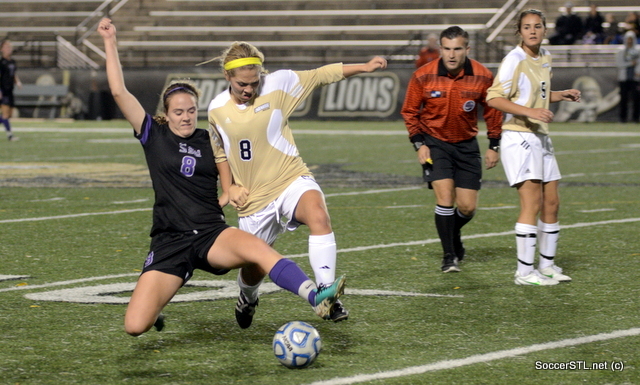 Missouri concludes spring action on Saturday, April 20 with a 10 a.m. contest against SLU at Walton Stadium. 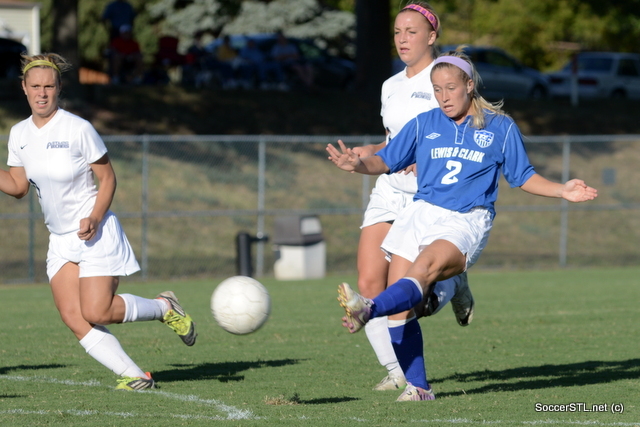 The Billikens went 5-9-4 overall in 2012 and allowed just 1.17 goals per game. 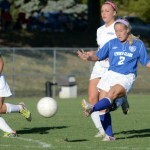 The team also announced a 2013 signing class of five, including Melanie Donaldson from Incarnate Word in St Louis. Donaldson plays for Lou Fusz Wipke, U18 Champions at the Missouri State Cup in October. The team has also qualified for the USYSA Nationals via the National League. Melanie’s #10 for IWA in the video below, and a captain. She’s pictured above following her golden goal game-winner captured below in the Sectional’s last Spring against Eureka. The GK she beat, Ali Wallner, is her club teammate on LF Wipke. It was an emotional scene last May. 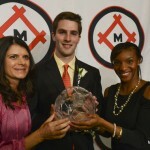 Junior midfielder Crystal Dunn from the University of North Carolina and junior forward Patrick Mullins from the University of Maryland are the winners of the 2012 Missouri Athletic Club’s Hermann Trophy, presented to the best female and male players in NCAA Division I soccer. The winners were decided by a vote of NCAA Division I soccer coaches whose programs are current members of the National Soccer Coaches Association of America (NSCAA), along with a fan vote that cumulatively counted as the equivalent of one coach’s vote. Junior forward Patrick Mullins from the University of Maryland is the winner of the 2012 Missouri Athletic Club’s Hermann Trophy, presented to the best male player in NCAA Division I soccer. Mullins, a New Orleans, La., native, led Maryland’s high-scoring attack with 17 goals and 10 assists. He tallied seven game-winners to lead Maryland to the best winning percentage in the country (20-1-3). The Terps advanced to the College Cup for the 12th time in program history in 2012. An NSCAA First Team All-American, Mullins’ 2012 season ranks sixth in points and goals, and eighth in assists in Maryland program single-season history. The forward was named ACC Offensive Player of the Year and tabbed Most Valuable Player at the ACC Championship after leading the Terps to their third ACC tournament crown since 2008. He also helped Maryland capture the ACC regular season crown for the first time since 2005. Mullins is the second player in Maryland history to win the MAC Hermann Trophy. Jason Garey – also from New Orleans – received the crystal soccer ball trophy in 2005. Crystal Dunn (Rockville Centre, N.Y.) is the fifth player from UNC to win the award, following Cat Reddick (2003), Cindy Parlow (1997, 1998), Tisha Venturini (1994), Mia Hamm (1992, 1993) and Kristine Lilly (1991). The seven MAC Hermann Trophies for the Carolina women are the most by any school. Dunn was a key member of the 2012 U.S. National Team that captured the U20 World Cup in Japan in September. As a result, she missed the non-conference portion of the Tar Heels’ schedule, but once she joined the lineup, her experience and versatility made an immediate impact. Dunn started at center back for the first 11 games back in the lineup before being moved to the center midfield for UNC’s six-game NCAA Tournament run. She played a key role in helping Carolina capture their 22nd national championship in school history. Dunn assisted on goals in both College Cup games. The three-year starter earned NSCAA First Team All-America honors and was named the ACC Defensive Player of the Year. The first runner-up was Penn State senior midfielder Christine Nairn (Arnold, Md.) followed by Virginia senior midfielder Caroline Miller (Rockville, Md.). 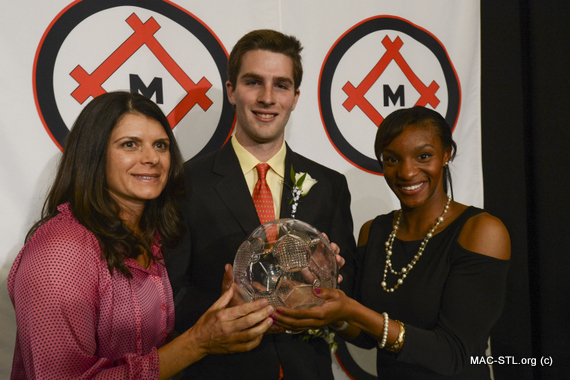 The Missouri Athletic Club has been presenting college soccer’s players of the year awards since 1986. The MAC was established in 1903 as an athletic, dining and social club. It has a “Platinum Club of America” status, which is awarded to the top 3 percent of private clubs in the country.